It’s a long, long way from Queensland, Australia to Stillwater, Oklahoma. The University of Queensland had palm trees and kangaroos. Oklahoma State has pickup trucks and cowboy hats. What could uproot a young woman and move her halfway around the world? Melody de Laat was a rising star back in Queensland. She earned a PhD as part of the world-renowned Australian Equine Laminitis Research Unit. 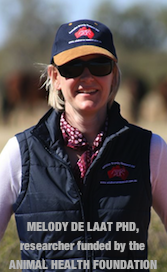 Director Chris Pollitt, BVSC, PhD instilled in her the curiosity and the drive to earn not just a doctorate, but a place in the small but significant legion of successful laminitis researchers scattered around the world. Working with Dr. Pollitt, Melody discovered that receptors designed to receive insulin-like growth factor 1 (IGF-1) may be binding to insulin instead in horses when horses have high levels of insulin. This groundbreaking discovery may enable scientists to develop strategies to try to block IGF-1 receptors from receiving insulin and prevent the disease from occurring. The equine foot is very dependent on glucose for metabolism, but it is not dependent on insulin to deliver that glucose. Horses have a large number of IGF-1 receptors in their feet, but no insulin receptors. Pollitt’s team theorizes that these IGF-1 receptors are being stimulated by insulin that mimics insulin-like growth factor 1 and is binding to these receptors. When this happens, the lamina stretch, and laminitis occurs. To continue her research, Melody accepted a post-doctoral position at Oklahoma State University College of Veterinary Medicine. Even though she has only been there a few months, she’s hard at work. Before Melody left Australia, she accepted a challenge to explain her PhD research in plain English to an audience who knew nothing about laminitis or horses--in three minutes. Melody’s research at Oklahoma State is funded by your donations through the Animal Health Foundation. Will her research make a difference to horses at risk for laminitis? The Animal Health Foundation believes it will. Problems associated with abnormal glucose (i.e. sugar) and insulin processes are of particular interest and concern in horses where a persistently increased level of insulin in the blood causes the development of laminitis. This condition is a relatively common one among many breeds. The current AHF-funded project being investigated by Drs. Lacombe and de Laat at Oklahoma State University aims to investigate how glucose transport and insulin signaling are regulated in the heart, muscle and lamellar tissues (in the feet) of horses that have laminitis associated with hyperinsulinaemia. This will be compared to glucose and insulin regulation in the same tissues of normal horses. Why is this important research? 1. This project will study tissues that have not been previously examined to assess the pattern of glucose metabolism during very high blood insulin levels. 2. The work will build on the limited available data on lamellar metabolism in horses with insulin-associated laminitis by investigating new topics such as intracellular signaling and inflammatory pathways in the foot and how they relate to glucose transport. 3. Characterization of the changes in glucose transport during conditions of high insulin will provide new insights into the mechanisms of insulin resistance in horses and may facilitate the development of novel therapeutic interventions for the management of metabolic diseases in horses. 4. Finally, better understanding of the insulin-signaling processes in the foot during increased insulin availability will improve our overall understanding of laminitis. This may lead to new avenues for disease treatment and prevention. The Animal Health Foundation is encouraged by Melody’s continued involvement in laminitis research, and in her move to the United States. We are confident that her research will yield results that will move our efforts forward and ever closer to our goal of ending this terrible disease. 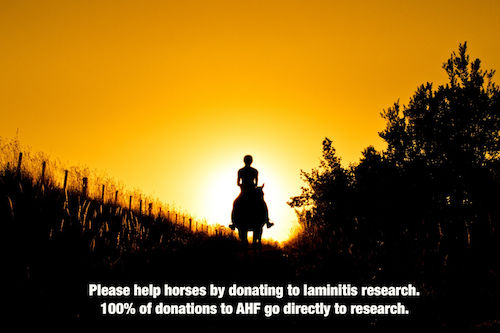 Thank you for your support of the Animal Health Foundation’s laminitis research.